I am a writer, a master baker, a maker of perfume, a mother of sons but before these things, perhaps the most integral sinew that is laced through those other roles, I am a tango dancer. I have never been to Argentina. I am not Latin in this or any other lifetime that I can recall. I speak English, and French and understand Italian but I do not know much of anything in Spanish other than the word hola. But in tango, I speak the language. Not only do I speak the language, but I am intimately conversant with tango’s slang and its metaphors; its dialect and its every sub dialect – each and every nuance and turn of phrase in each and every turn of hips. My lips never move but my body speaks tango which is essentially voiced and articulated in strings of tumbling expression, lavished by the language of limbs, articulated and nuanced with the music, and all puppeteered by the soul. A tango dancer is a unique being that crosses time, history, culture, age, gender, music, and god. I am what they term a tanquero - a willing hostage who has, on her tango journey, morphed into something native, a supplicant to tango’s rhythm, and a student of its many lessons. In tango’s embrace, you become unrecognizable to those who know you best and yet most present, most real, most recognizable to yourself. It is not about the dance itself; it is barely about romance. It is everything and anything to do with connection and intimacy of the spirit. Tango has a very simply contract. It asks you to dance and you say yes and then you surrender. That is all and that is everything. This surrender is not evidenced by a laying down of weaponry or turning over of terrain or territory but in a relinquishment of another order. Tango takes no prisoners but once you dance it – you never can return to who and what you were. You might leave the dance floor and even neglect tango for a time, but it it stays with you in cellular persistance and pulses in your blood. It makes you proud and strong but make no mistake: it owns you. I am a tango dancer. My legs twitch like an impatient horse when I yearn to dance. Left to wait at an elevator door, a bank or movie lineup my legs will do ouchos by default, flexing in memory and habit. Alone on a street at night or in the park by the fountains in the mid day where all or anyone can see, tango has a way and its will and so I dance, unharnessed, uncaring, seemingly unpartnered but I will dance. I am a tango dancer, nothing more, nothing less than a courtesan to passion’s footwork and the draw of a God who is only as sensual as she is divine. Whatever else I look like, wherever else I am born from, whatever else I do and speak and am – I am tango to the bone. Tango is etched and in a rare ink in an indelible bar code only other tango souls can see. We see each other sometimes, in a crowd, a café, passing in the street and we smile but we say nothing. We nod and eyes quietly salute. We have no need to neither talk outside tango nor ask what our lives outside that life, is like. It is a given we exist in moments and touches and that space between the bars of music where there is no sound, only salvation. Tango is the lullaby that croons me to sleep; it is the bird song that wakes me if I sleep too long. It makes me come alive when I tell life I have lost my passion simply in insisting I dance and stay the course until I find my passion again. So I dance; first - to appease the tango spirits and ultimately, to rescue myself. Both tango and I are quenched as we glide onto the floor, sighing in our reunion, proxied by the arms of another human being in a similar engagement. It's just how's its done. Shhhh….Do you hear that sound? That flick and slither? That is a hiss of a gypsy whip; It is tango’s kiss. 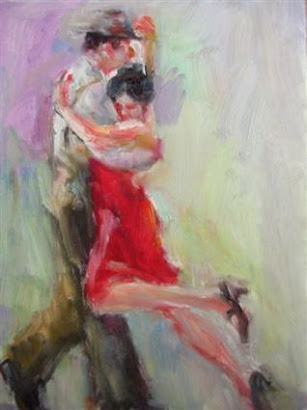 Like a tongue seeking truth, tango sabotages the senses and ambushes the heart. It is not a pastime. It is not like fox trot, rumba, flashy salsa or elegant waltz. 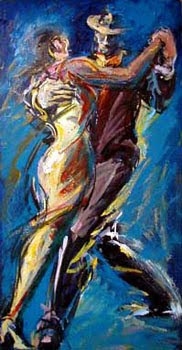 Ballroom dance is form over content; tango is content beyond form. It is in every breath you intake and spill out onto the floor in four/four time.